Place all the ingredients in a food processor and pulse until it resembles crumbs. Form into ball, wrap in plastic wrap and refrigerate for 30 minutes. Roll out pastry dough (about 1/2" thickness). Cut 6 6" circles. 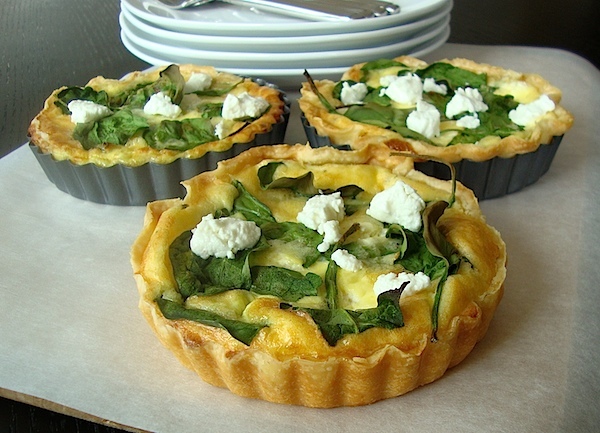 Place in the prepared 4" diameter mini tart pans (6), covering sides also. Whisk eggs and cream to fully combine. Season well with salt and black pepper. Arrange spinach, shallots, and goat cheese crumbles in pastry shell. Pour egg mixture into pastry shell. Season with salt and black pepper. Bake 20 to 30 minutes or until set. Allow to rest for about 10 minutes before serving. Awsome recipe Mia! What oven temp should this be baked? Can't wait to try this! What temperature did you bake at?